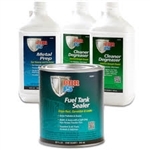 Water-based, non-flammable rust remover and pre-primer. Removes rust from all metals and re-usable. Kit Includes: 8oz POR15 Cleaner Degreaser, 8oz POR15 Metal Prep, 4oz POR15 Rust Preventative Coating, Paint brush, latex gloves, and detailed instructions/tips. Paint directly over rust. Seals rust permanately, lead-free. For metal substartes only. Paint directly over rust. Seals rust permanently and is lead-free. For metal substartes only.